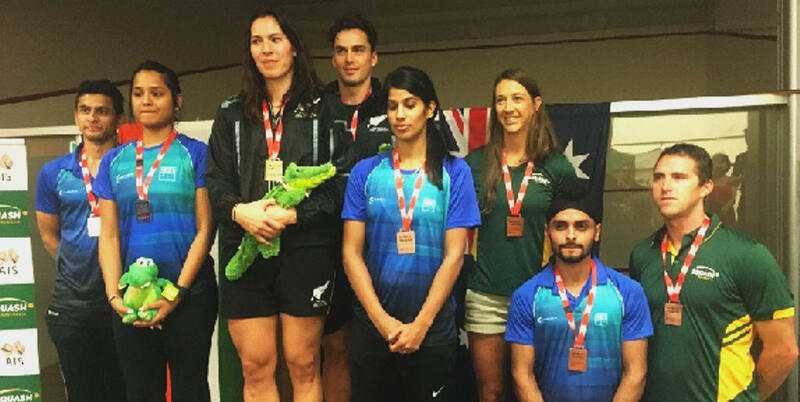 Success in two of today's finals in the WSF World Doubles Squash Championships in Australia has led New Zealand's Joelle King to become the first player to win two gold medals in the same championships since 2004. The climax of the World Squash Federation event took place at the Darwin Squash Centre in Darwin, where King went into both finals in a third-seeded pairing against the events' No.2 seeds. Partnering Amanda Landers-Murphy in the Women's Doubles final, world No.9 King, from Cambridge on North Island, beat home hopes Rachael Grinham & Donna Urquhart 11-7, 11-4. It was Grinham who, 12 years ago, won gold in both the Mixed and Women's finals in India. Indian pair Dipika Pallikal Karthik & Saurav Ghosal were King and Paul Coll's opponents in the Mixed Doubles final. The Kiwis rose to the occasion in fine style, despatching the higher-seeded duo 11-8, 11-8 to give double gold to New Zealand. "We thought we were in with a chance," said King after both triumphs. "I don't think we knew we could win two golds - but it's pretty good to take them back to New Zealand!" Second seeds Alan Clyne & Greg Lobban faltered in an earlier qualifying round of the Men's Doubles when they went down to the third-seeded New Zealand pair. But there was no stopping the Scots in the final where they dashed Australian hopes of a championship gold medal by beating the fourth-seeded pair David Palmer & Zac Alexander 11-8, 11-4. Hosts Australia are predicted to take gold in two of the three events in the 2016 WSF World Doubles Squash Championships in Darwin next month according to the seedings announced today by the World Squash Federation - while Queenslander Rachael Grinham is expected to become the first player in the sport's history to win gold in three successive championships. The championships, featuring Men's, Women's and Mixed events, will take place at the Darwin Squash Centre in the Northern Territory capital city from 15-18 August. Grinham, the 39-year-old former world number one, will partner Cameron Pilley, the world No.14 from New South Wales, in the Mixed Doubles. Winner of the World Mixed title in 2004 in India in 2004 with David Palmer, and the 2006 gold medal on home soil in Melbourne in 2006 partnering Joseph Kneipp, Grinham is also the reigning Commonwealth Games Mixed Doubles champion after claiming the 2014 title in Scotland, again with Palmer. Pilley also struck gold in Glasgow in the Men's Doubles - with Palmer - and reached the 2006 World Mixed final (with Amelia Pittock) where he lost out to his 2016 partner Grinham. Pilley is bidding for a Darwin double as top seed in the Men's Doubles, with left-hander Ryan Cuskelly. Also a New South Welshman, Cuskelly is ranked 16 in the world. Grinham is seeded to reach the Women's Doubles final, with Brisbane-based world No.21 Donna Urquhart - but it is the Indian pairing Joshna Chinappa & Dipika Pallikal who are firm favourites for gold after becoming the Commonwealth Games champions in 2014 against the odds. Both sharing India's highest-ever world ranking of 10, Chinappa & Pallikal would become India's first ever world squash champions. Colombia will be making their World Doubles debut. Following their Pan American Games Men's Doubles title success last year in Canada, Andrés Herrera & Juan Camilo Vargas will be appearing in the Darwin championship for the first time, where they are the fifth seeds. Compatriot Miguel Angel Rodriguez, the world No.5 renowned for his spectacular diving around the court, will be bidding to cause an upset in the Mixed championship, where he and partner Catalina Pelaez are the No.6 seeds. 2014 Commonwealth Games stars Alan Clyne & Greg Lobban, the local pair who thrilled the crowds by making the bronze medal play-off in Glasgow, lead the Scottish bid for success where they are second seeds in the Men's Doubles. But the Scots may well have to overcome third-seeded New Zealand pairing Paul Coll & Campbell Grayson to make the Men's final. Early action in the three championships will take place in pools, before reaching the semi-finals on Wednesday 17 August and the finals the following day.